CodeTwo Exchange Rules 2010 is a full scale manager for email signatures which operates on corporate or individual correspondence and adds signatures no matter what email client you use, is it a desktop client (e.g. Outlook) or a mobile device. This program is a central and automatic email signature/disclaimer solution that exceeds native Exchange transport rules, and allows to create your own signatures and add them to outgoing messages. Adding signatures to emails processed by all sorts of different clients e.g. OWA, Outlook, Thunderbird, Android, Blackberry, etc. If you need to deploy server-side email signatures in Office 365, please use CodeTwo Email Signatures for Office 365. Signatures and disclaimers are added automatically to email correspondence. Decide what conditions must be met and what actions to be taken by the program to stamp the correspondence adequately to your needs. 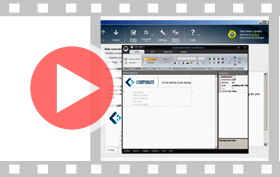 Control the whole process of mail signature adding just from one seat. The program can be managed from a central administration panel for setting up rules and creating your signature for the whole company. Adjust your signature’s layout by incorporating various graphical elements like logos, photos, marketing banners and visuals. You can modify your customizations through built-in HTML editor with a set of formatting tools. You can use CodeTwo Exchange Rules 2010 with all email clients like OWA, Outlook, Thunderbird or Android, etc. The program is not affected by clients in any way as it processes emails and adds signatures on the server’s side. If you are considering to create different signatures for various departments in your company then there is no easier task for CodeTwo Exchange Rules 2010. The program allows to create and add different signatures to emails depending on properties like location, domain, email address, and many more. Our developers has invested a great deal of effort to let you fully project and design professionally looking signature. It can be done with built-in Template Editor which is equipped with all formatting options that allow you to change fonts and color schemes, add images, tables, social media buttons or hyperlinks. Personalize your employees' signatures with dynamic placeholders which automatically pull the data from Active Directory properties. This way you can keep signatures individually crafted for each user and unified for the whole organization. You decide where to place a signature in messages. Set the program to automatically insert your signatures under the latest reply, at the top of the message or at the very bottom. Any data like users credentials can be automatically generated as a QR code and added to a signature in each sent email. You can use this feature to fill in data pulled from Active Directory and have it transformed to pure QR code in your signature. Create you signature and proof it. With the Rules Tester option you can check out your new signature and test applied rules in a mailbox virtual environment. Send a test mail and see the outcome! Adapt the full potential of signatures in your marketing campaigns with CodeTwo Exchange Rules 2010 by simply implementing banners and visuals that will promote your brands, products, events, etc. See your signatures added to messages in the Sent Items folder. This feature enables you to automatically stamp sent messages and immediately view how they present in Sent Items. The deployment of the program is ultra-fast to complete. Right after the installation experience the easy-to-use interface which allows to smoothly discover the program’s functionalities and create your own signature or load one of the pre-defined templates to quickly test the application. Test the program’s fully operational trial version and enjoy all features for 30-days. In case you need assistance contact us by email or phone. We can always extend your trial period time for testing if needed. Easily add email signatures, disclaimers and marketing banners to emails sent from Exchange Server 2010.